Firms in the accounting and financial consulting arena tend to have more commonalities with each other than differences. In many cases, their services, processes, and even benefits are essentially the same. Fortunately, there is a proven way for your firm to develop a strong differentiation strategy—and it is based on the expertise your people already have. In this article, Dr. Frederiksen discusses how expertise can be used to develop and maintain a competitive advantage. Firms in the accounting and financial consulting arena tend to have more commonalities with each other than differences. In many cases, their services, processes, and even benefits are essentially the same. Fortunately, there is a proven way for your firm to develop a strong differentiation strategy—and it is based on the expertise your people already have. There are really only two ways to gain a competitive advantage. One is to compete on price: saying you are just as good as the competition, but less expensive. But, it is difficult to sustain this strategy for long—and it exposes you to commoditization, a narrower margin, and a much wider range of competitors. A better way is to stand apart; separating yourself from the rest in a way that potential clients find impactful and relevant—in other words, to have a differentiation strategy. 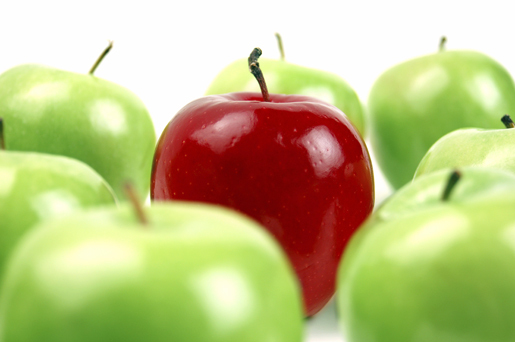 What Makes a Good Differentiator? It may seem obvious, but you need to make sure your differentiator actually makes you different. For example, our research found that 66% of professional services firms claimed client service as a differentiator. But, when more than two out of three firms are claiming the same thing, can it really be a differentiator? Is it true? Apart from the fact that simply making something up is wrong, it is just too easy for people to see through exaggerated claims. Remember, you will need to deliver on all claims. Is it relevant? Your differentiator has to resonate with prospective clients as something that plays a part in their selection criteria and decision making process. Any non-relevant differentiators are wasted effort. Is it provable? You may have found a true and relevant point of distinction, but without proof, it is useless. Even if everyone says a differentiating statement is true, without a way to prove it, it will be ignored. When you provide professional services, what you are really selling is expertise. Clients are buying your services because they solve a problem—such as complying with a regulatory requirement or solving a specific strategic challenge. We have researched the reasons why companies select one professional services firm over another. Expertise is the leading selection criteria, and it is frequently the one factor that tips the scale for the firm that wins the contract. Despite this fact, we have found that sellers consistently underestimate the role that their expertise plays in the final selection. Need more proof? In our most recent study on the topic of referral marketing, visible expertise plays the single most significant role in driving referrals (37.3% of all referral-driving factors). Social and professional relationships are still important, but only when the buyer is also aware of the provider’s expertise. Okay, you may be saying, we need to use our expertise as a differentiation strategy. But, there is a catch: your firm’s expertise is often unseen by the marketplace. And what is invisible to clients may as well not exist. Fortunately, it is possible to make something as intangible as expertise visible and real to clients. 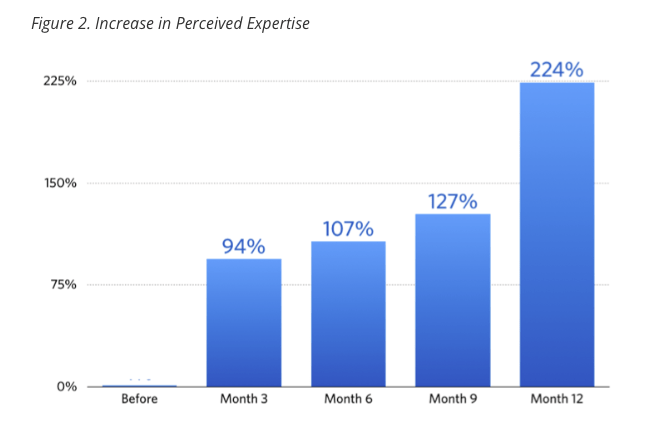 We did extensive research on how professional services buyers go about hiring visible experts. As we outline in The Visible Expert, some of the most effective ways to demonstrate your expertise are public speaking, and writing blog posts, articles, and books. A successful strategy starts with knowing exactly what you want to be recognized for. Your area of expertise should be important to clients, and broad enough to last. That said, the narrower and more specialized your area of expertise, the easier it will be to make it visible and defend it against potential competitors. The next step is to conduct research to make sure your firm’s area of expertise aligns with potential clients’ desires and preferences, which will help you select the issues to write or speak about. Gaining this insight is crucial to success: our research has found that the fastest-growing firms (those growing more than 20% year over year) are twice as likely to conduct research as their no-growth peers. By creating a well thought-out differentiation strategy and being persistent in how you implement it, your firm’s visibility and the perception of your expertise will not only increase, but even accelerate. 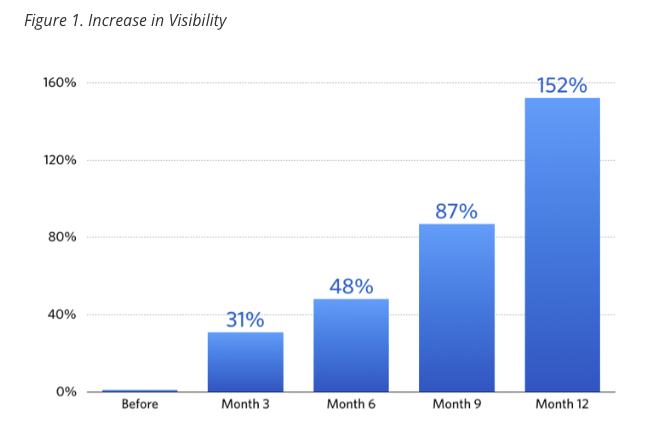 Figures 1 and 2 show the average increase in visibility and perceived expertise experienced by firms going through the Visible Firm program. Remember, the goal here is to not to simply be visible in the marketplace. If that is all you are seeking, greatly expanding your advertising budget could be the answer (at least until someone with a bigger budget comes along). In any case, mere visibility will not succeed at positioning you with prospects as different in any relevant way. Based on our research, taking a diligent approach to pushing out content that demonstrates your expertise on matters important to clients is by far the most effective way to gain the visibility that leads to new business.